I believe that the two words “lamb soup” are enough to make anyone’s mouth water. 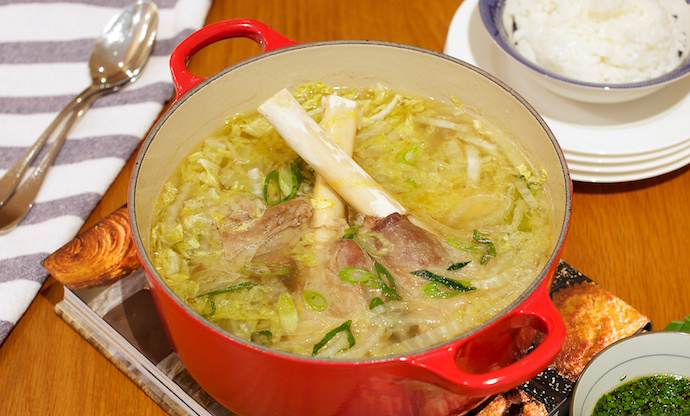 The method for making Chinese Lamb bone Soup varies from place to place, but in general, it can be made in two different ways: a clear broth or a milky broth. 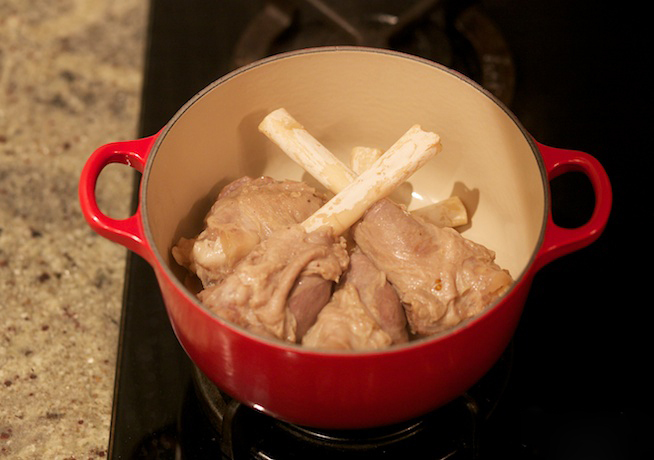 To achieve a clear broth made from lamb on the bone you must simmer it on low heat. However, lamb simmered on high heat has a creamy appearance. 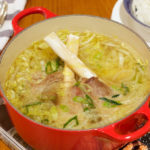 To make a clear soup, you need to simmer it on low heat so that the collagen and other nutrients in the meat, bones and tendons seep slowly out forming the flavor of the soup. 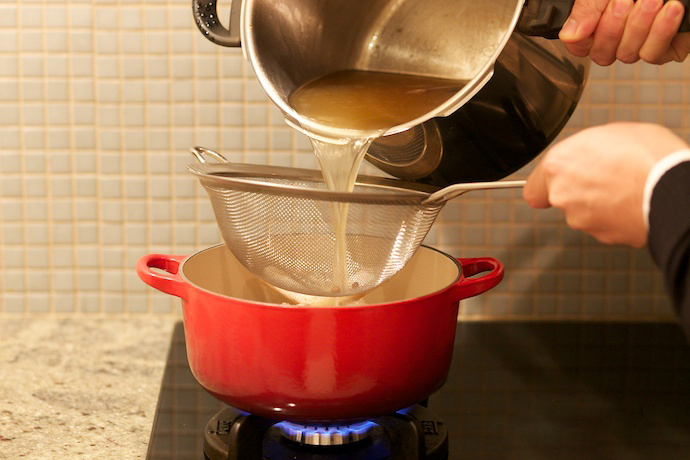 When the soup is cooked on higher heat, the collagen and nutrients seep out more quickly and this faster process gives the soup a milky or cloudy appearance. This may sound easy to do; however, it is quite hard to form a milky broth when you are relying solely on the lamb, bones and sheep oil. Sheep skin contains more collagen and will help achieve a good milky broth, similar to, for example, Pig Skin Stock, which is easy to boil to a milky broth. 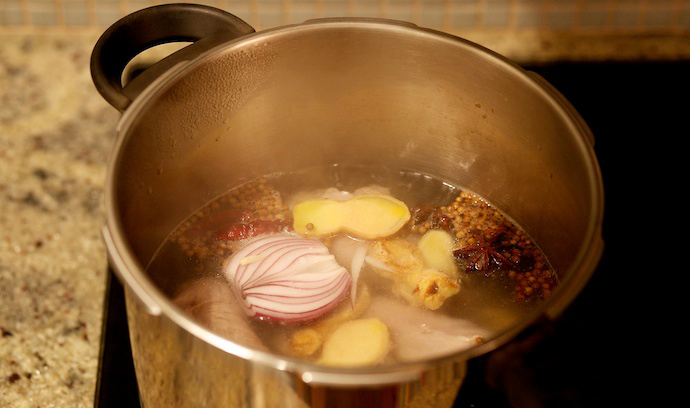 Today I will introduce the method of using a pressure cooker to cook lamb soup quickly. This is a simple and convenient technique which will result in a fresh and delicious flavor. First, let’s discuss the choice of ingredients. The flavor of the lamb soup comes from the collagen which dissolves in the water, and without this, the soup will be bland. 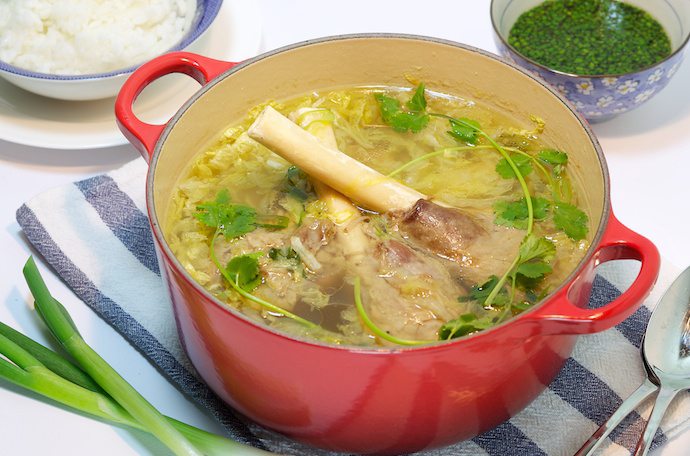 Lamb shanks are perfect for making a great lamb soup. Expensive lamb tenderloins and other lean, tender parts are more suitable for stir-frying, however, if you use them to make soup, you will not get good results. Instead, use the cheaper bones which are full of tendons, and you will get the most delicious flavor from these. 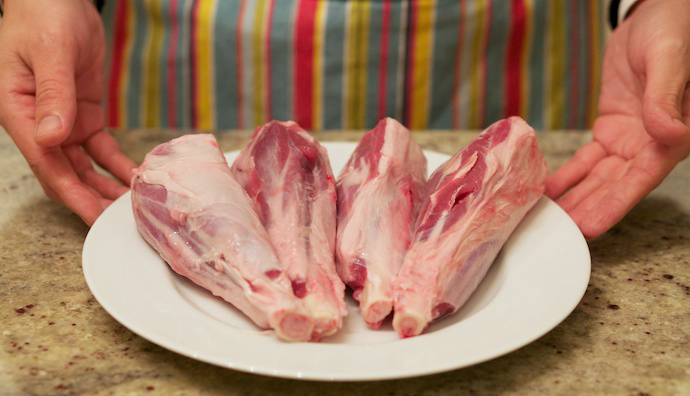 The figure below shows “frenched” lamb shin bones, or shanks. The joints below the lower leg are severed, and the ligaments are cut with a knife. During cooking, the muscles move upwards along the bones, exposing the lower bones, which is more pleasing to the eye. We will start preparing the lamb legs. First, rinse the lamb legs and place them in the bottom of a pot. Pour in some boiling water and heat on the stove. Soon a bloody foam will form on the top of the water. After boiling for two to three minutes, remove the lamb and wash off the residual blood. We can see that after a short period of time on the heat, the lamb has begun to shrink, revealing part of the bone. 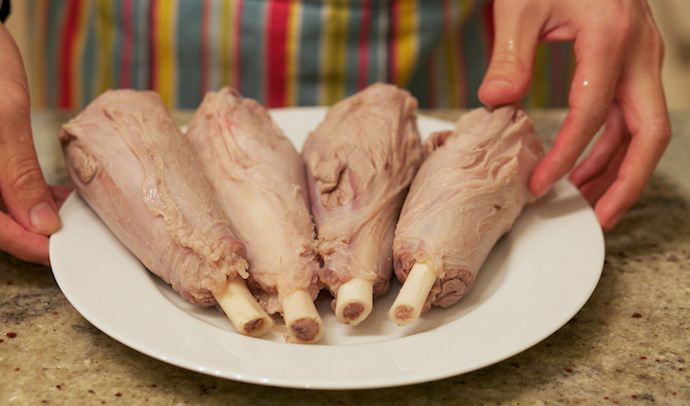 Place the lamb legs into the bottom of the pressure cooker and pour in enough boiling water to cover them. 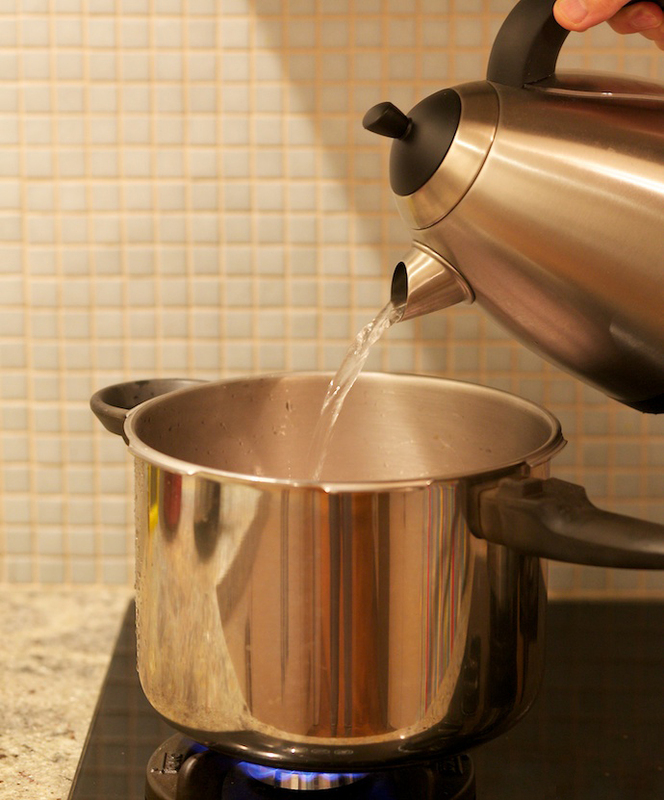 Use your electric kettle to boil the water quickly in advance, saving time. Add some seasoning according to your personal preference. My favorite seasoning combination is 1 teaspoon pepper, 1 teaspoon of coriander seeds, 2 dried peppers, a few slices of ginger and half an onion. The lamb should cook for about an hour in the pressure cooker. When it is finished cooking, you will notice that the soup has reduced a little and most of the flavor has now seeped from the lamb into the water. 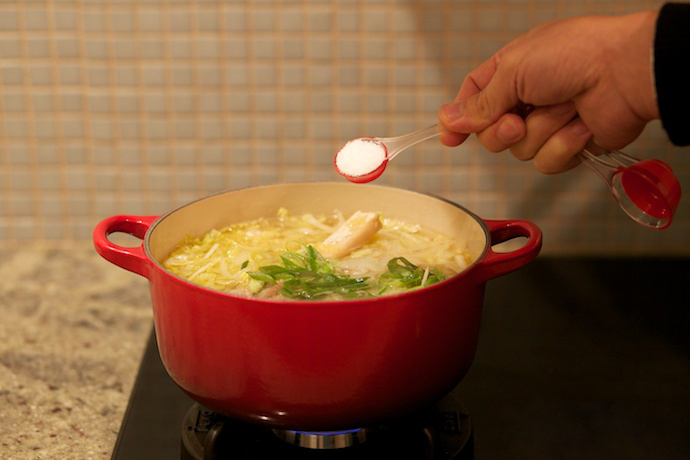 Do not cook the soup any longer than an hour as the longer it cooks, the less flavor will be retained in the meat. While the lamb is cooking, prepare the vegetables. Chinese cabbage is my favorite choice. Wash about 100g of cabbage leaves and, using your knife, cut it into thin strips. The smaller the shreds, the shorter the cooking time. It does not take too long for the cabbage leaves to become soft, so you can put in a little more. 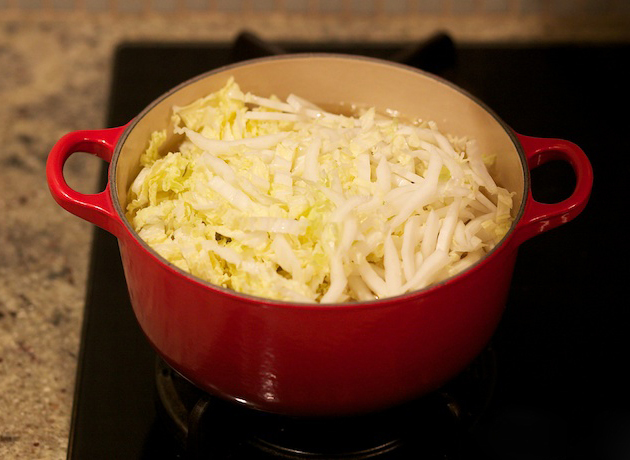 The soup will become very fresh and sweet with the addition of cabbage. An hour later, after the pressure from the cooker releases, transfer the lamb into another pot. Pour the broth over the shanks through a sieve to filter the spices out, ensuring the soup is clear. Wait until the cabbage leaves become soft and transparent and you see that the broth is hot enough, then add the chopped green onion. Finally, add some salt to taste and serve. Do not forget to garnish the lamb soup with some coriander leaves. Of course, if you want to try a different flavor, you can also make a simple and delicious sauce (look at the picture below) for the lamb. 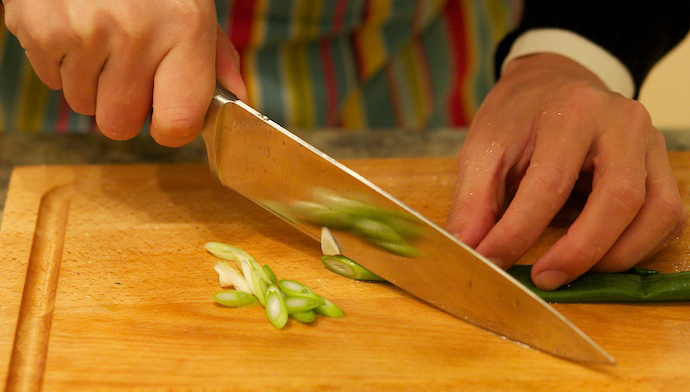 You will need: chopped chives, dark soy sauce, light soy sauce, vinegar and sesame oil. 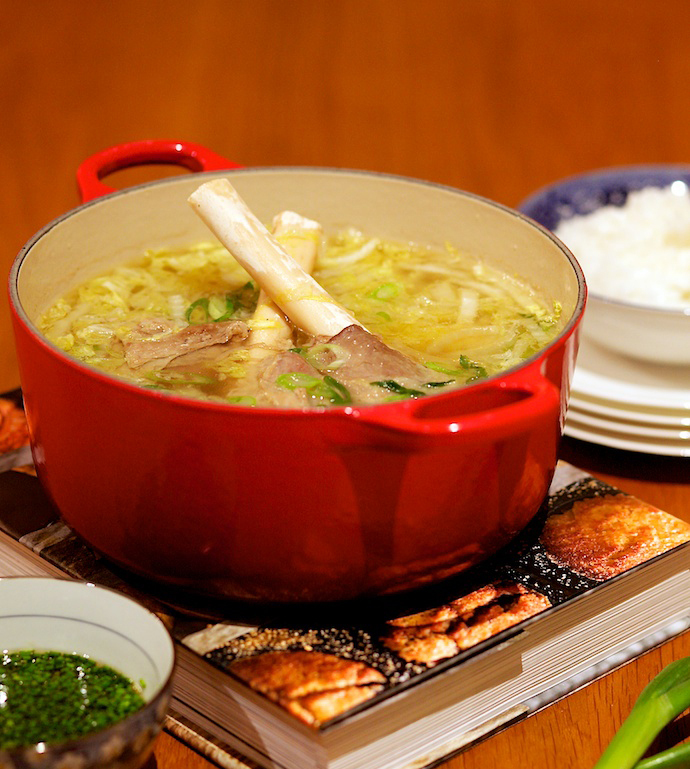 Cup your hands around a mug of steaming Chinese Lamb Shank Soup, sit by the fire and warm up those cold bones. First, rinse the lamb legs and place them in the bottom of a pot. Pour in some boiling water and heat on the stove. Soon a bloody foam will form on the top of the water. After boiling for two to three minutes, remove the lamb and wash off the residual blood. Place the lamb legs into the bottom of the pressure cooker and pour in enough boiling water to cover them. Add some seasoning according to your personal preference. My favorite seasoning combination is 1 teaspoon pepper, 1 teaspoon of coriander seeds, 2 dried peppers, 4 sliced ginger and half an onion. 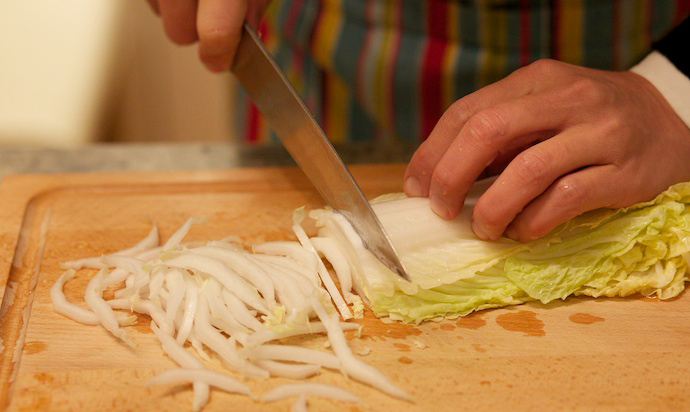 Wash about 100g of cabbage leaves and, using your knife, cut it into thin strips. My mother had a pound of lamb bones left over from another meal. I used them in this recipe with outstanding results. I don’t have a pressure cooker so I simmered the broth in a Dutch oven for about 6 hrs before straining and adding the cabbage. I would absolutely make this again. I loved that you didn’t need to purchase too many specialized ingredients.